To eat or not to eat the cupcake? That is the question ( to ask your body)! Every day you make over 200 food choices. When to eat, where to eat, what to eat, how much to eat, with whom to eat (or not). Most of these decisions happen so quickly, you may not even realize you’ve made a decision. When you try to make different decisions, it quickly becomes apparent how challenging making good decisions can be. The influences that can lead you away from satisfying your body’s needs for optimal nutrition and towards cheap, processed, grease-laden foods are many. On the road, every other billboard is for fast food. On TV, images of sugary, salty, and fatty foods abound. When was the last time you saw a commercial for broccoli? In the supermarket, the aisles are teeming with rows of processed food, and checkout lanes are a sugar fest. This sugar fest continues while you wait in line to pick up a prescription, with candy bars lined up neatly under the counter. At work, there is (yet another) cake a coworker has brought in to celebrate a birthday. When your friend orders the bacon cheeseburger, it makes it harder to get that nutritious kale salad. How can you successfully navigate all these food choices? By practicing awareness, or mindfulness. Awareness allows us to notice how food affects our bodies, minds and emotions- and how physical and emotional states affect our food choices. 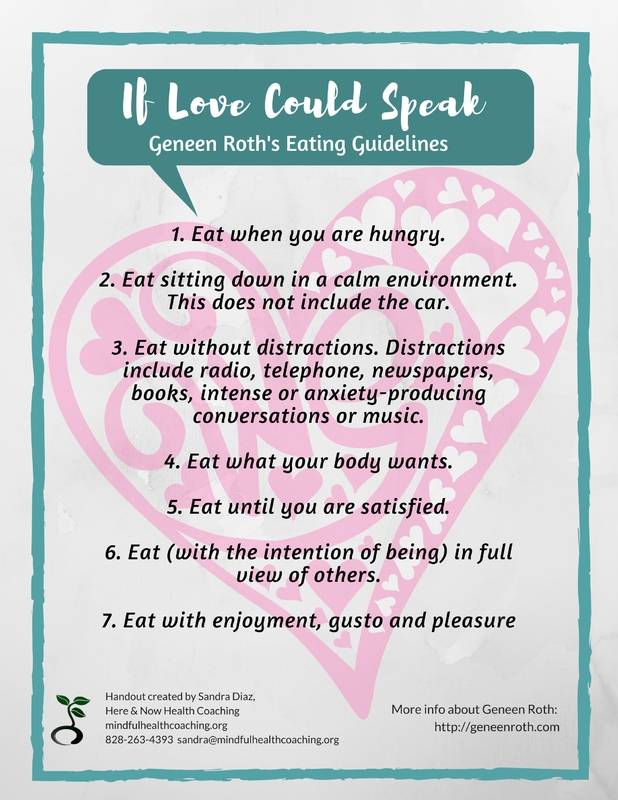 Geneen Roth, a pioneer in intuitive eating who has helped tens of thousands of women come to peace with food, has developed Eating Guidelines. These guidelines are simple, straightforward and useful for everyone. They help to counter a food environment that is constantly encourages us to give into a moment of gratification instead of lifetime of well-being. By slowing down and being present with your body and your food, you start to notice the actual experience of eating these foods. Let’s go over the 7 guidelines. Here is a PDF of the eating guidelines that you can download and keep. How often do you eat because the food is there, beckoning? How do you know if you are experiencing true hunger? True hunger is present in your stomach. Another sign is that a number of foods can fulfill your needs versus a desire for a specific food. This is a hunger you feed with food. It is easy to confuse stomach hunger with mouth hunger, which is the desire to taste a food but it not a true need for fuel in the body. Recognizing this, you can then decide what to do- maybe you simply have one taste (if you know that is possible for you). Then there is hunger that, when investigated, is actually an unfilled emotional or spiritual need. This is known as heart hunger. Food can seemingly provide an all-too-easy substitute for the hug or a listening ear you really need. Food is always there for us, and people be inconsistent. Practice recognizing these different types of hunger to help you make the best decision in the moment. #2 & #3 speak to your environment. Studies show that we eat more when we aren’t paying attention. You don’t realize the bag of chips is empty during our favorite TV show until you reach in the bag to discover all the chips are gone! Oops! Without distractions, you will be more likely to enjoy your food and notice how it affects your body and mind. This one is tricky because you have to learn the difference between what your mind desires and what your body needs. This intuition takes time to develop. Start by becoming aware of your body from the inside out. The breath can a natural bridge between our awareness and the body, so place your attention on the breath. Then ask your body what it wants. The body will reveal the answers over time. Another practice that can take time to develop is noticing how the body responds to food. Is this food providing you energy, or does it make you feel sick or lethargic? It’s OK to make mistakes. But if you don’t start practicing, you will never get better at it. This guideline is much easier to follow if you are following the two previous guidelines. Paying attention allows you to notice when you are getting close to full. It takes the brain up to 20 minutes to receive the signal that the stomach is full, so eating slowly helps the brain catch up. The Japanese saying “Hara hachi bu” advises you to eat until you are only 80% full. This might sound counter-intuitive in tandem with the other guidelines, but when you follow your body on the road towards health and vitality, you will find more joy in the healthful foods. And when you decide to give in to a craving or a less healthful option, you can do so with joy. Feeling conflicted about what you are eating is confusing to the body, slowing down your digestion. It’s also confuses the mind- berating yourself while eating sets you up for a treacherous cycle of deprivation and craving. A personal example: The thought of making cookies has drifted through my mind a few times over the past couple of weeks (winter blues, anyone?). A snowstorm today forced me to stay home today. I decided this was the day to make cookies! I made them from more healthful ingredients (like gluten-free and protein-rich chickpea flour and coconut oil) but they were still coooookies! I ate 3 of them (I know!) but then I was done. Geneen Roth’s also calls these guidelines “When Love Speaks”. If you were encouraged by your environment, your family and your society to deeply honor and love your body, these guidelines would be unnecessary. But when you are constantly being judged by your weight, being encouraged to ignore your body’s hunger cues (like when your mom threatened to punish you if you didn’t “clean your plate”), being emotionally manipulated by food manufacturers to buy the latest, greatest fat, sugar and salt deliver device (Kellogg’s Donut Cereal, anyone? ), it can difficult to stay grounded to your body’s needs for nutrition. If you aim to follow these guidelines, even if you fail sometimes, you are subverting the dominant paradigm, in which food companies strive to get you to eat their newest “invention” with little regard to the impacts on our health. What is the first step you can take in speaking love to your body today?